If you are looking for a 100% green carpet cleaning company in Langhorne, PA, you have come to the absolute right place! 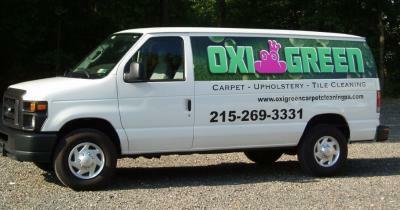 OxiGreen in Langhorne, PA is a 100% green, pet and baby safe carpet cleaning company. All of the cleaning agents we use in our carpet cleaning process are totally biodegradable, safe for the environment and everyone who steps foot inside your home or business. Not a bit of toxic residue will ever be left behind to lower to air quality or threaten the health of your family member, friends, customers and employees. No harsh chemicals are used that could potentially damage the fibers of your carpets. Coupled with our state of the art, truck-mounted carpet cleaning machines, OxiGreen delivers an effective and thorough carpet cleaning. Our process dislodges the dirt, dust mites, bacteria, and other debris that is ground deep into the fibers of your carpet. Our superior suction removes these pollutants right along with 98% of the water used in the cleaning process, leaving behind super clean, fresh and healthy carpets that normally dry in just an hour or two. No need to disrupt business or your family’s daily routine! OxiGreen is a locally owned company that really cares about our reputation in the community. We are committed to doing an outstanding job for you so we can add you to our long list of happy, repeat customers. Don’t hesitate! Call OxiGreen in Langhorne, PA at 215-269-3331 to talk to one of our helpful customer service reps. We are here to answer your questions, schedule an in-home carpet inspection, or to schedule a same day cleaning appointment for you. OxiGreen employs only highly trained and certified carpet cleaning technicians and we offer a 100% satisfaction guarantee. For the best in the business, call OxiGreen today!